After several years of absence, M. Steinert & Sons has returned to the organ market in a big way. We are proud to be an important resource for liturgical musicians, providing not just the world’s finest pianos, but also an impressive array of church organs from the country’s leading organ makers. M. Steinert & Sons is pleased to be the New England distributor for Rodgers Organs. 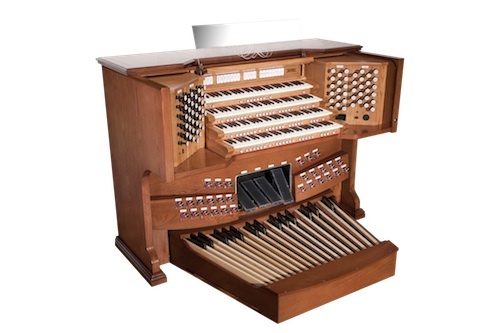 These exceptional American-made instruments are among the most popular organs for concert halls and houses of worship across the country. From Carnegie Hall to local churches, Rodgers Organs lead the way. The recent introduction of the Rodgers Infinity Series has opened exciting new options in organ music. Infinity organs deliver magnificent sound with powerful, exciting performance, and exquisitely crafted specifications. With Infinity, Rodgers has raised the performance bar by opening dramatic and unexpected new dimensions in musical excellence. These finely crafted organs are ideal for houses of worship of all denominations, and all sizes. Rodgers has been making organs for more than 50 years, based on a mission of Inspiration, Innovation and Assurance. The company is based in Hillsboro, Oregon. It was founded by two high-tech engineers who with a love concert-quality organ music. As a result, Rodgers has pioneered many technical breakthroughs in organ performance. The company was at one time owned by Steinway Musical Instruments, but became part of the Roland organization in 1988. Click here for a series of high quality video and audio recordings of Rodgers Organs in performance at churches and houses of worship. M. Steinert & Sons has a dedicated Institutional Sales Staff to assist you with selection of your instrument, as well as supportive services including capital campaign assistance. We look forward to helping you bring beautiful music to your worship.